This impressive-looking potato side dish is not much more difficult to make than your average baked spud. It combines the crispiness of French fries with the creaminess of a well-baked potato. Stuff your potato fans with a non-dairy cheese, or make them just as the recipe calls for. Either way, you’ll wonder why you never made something this simple before. It seems appropriate that Easter and the Christian Holy Week often overlap with the eight-day Jewish holiday of Passover. Both are festivals of equal gravity in their respective traditions and both celebrate spring and hope. And, of course, both are associated with traditional foods and recipes that have been passed down through the generations. Vegans have learned to adapt these traditions with plant-based recipes that are worthy for both taste and the compassionate thinking behind them. No matter what you serve, or where you find yourself eating on these holidays, one dish that is certain to be a welcome accompaniment is Crispy Potato Fans, found in a newly-released vegan cookbook, For Goodness Sake: Plant-Based Recipes from the Spiral House Kitchen © 2015, featuring recipes by Chef Diane Hagedorn and photographs by Andrea Barrist Stern. Recipe and photo reprinted by permission. This impressive-looking potato side dish is not much more difficult to make than your average baked spud. Cut a small slice from the bottom of each potato so that it sits flat. Working from one end of the potato to the other, cut thin slits, slicing almost to the bottom but not completely through. These cuts need not be wide; the potatoes will fan out as they bake. Immediately place the potatoes in cold water after slicing to keep them from discoloring. In a shallow bowl, mix the olive oil, salt and pepper, rosemary, thyme, and garlic. Drain and dry the potatoes, then roll the potatoes one at a time in the olive oil mixture to coat. 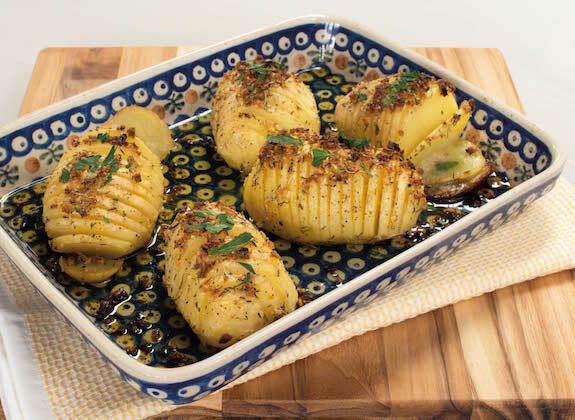 Arrange the potatoes in a baking dish and pour any excess seasoned oil over them. Bake for 45 to 60 minutes, or until crispy and brown on top. Diane uses Idaho or russet potatoes here because they hold up great and have a distinctive oval shape that makes an attractive presentation. If you’re making more or less than the recipe suggests, use 1 clove of garlic per potato. Visit the For Goodness Sake blog at for more delicious and inventive vegan recipes by Chef Diane Hagedorn, luscious photography by Andrea Barrist Stern, gardening tips, and information about the vegan lifestyle. You can purchase the book while you are there, at online sellers, or from your local independent bookstore.